Education and gun-safety experts said the Education Secretary's decision could allow schools to use federal funds to buy firearms. Education Secretary Betsy DeVos says she has "no intention" of taking action against schools using federal grant money to purchase guns — a decision that leaves it up to states to decide how such funding should be used and that infuriated gun-safety advocates. DeVos disclosed her position in an Aug. 31 letter to Rep. Bobby Scott, D-Va., following the news that the Education Department was considering a proposal to allow school districts to use federal funds known as Student Support and Academic Enrichment grants for guns and gun-training. The grants give states "substantial flexibility" on how school districts should use the funds, and federal officials do not have the authority to tell them how the money should be spent, DeVos said in her letter. "Therefore, I will not take any action that would expand or restrict the responsibilities and flexibilities granted to State and local educational agencies by Congress." Scott, the top Democrat on the House's Committee on Education and the Workforce, said DeVos' announcement would "recklessly endanger both students and educators," adding that it was not Congress' intent to let states decide whether to spend the money on firearms. "It is outrageous that Secretary DeVos will allow federal education funds to be spent putting guns in the classroom," Scott said in a statement. Education and gun-safety advocates said DeVos had the authority to act and was effectively giving states the go-ahead to purchase firearms with the money, while trying to evade responsibility for doing so. The Education Department's proposal emerged after Texas and Oklahoma asked federal officials how the funds could be used, citing questions from local school districts about using the grants to purchase guns. "Secretary DeVos and the department cannot claim to be taking 'no action,'" said Adam Skaggs, chief counsel for the Giffords Law Center. "By its words and actions, the department is very clearly giving a green light for the misuse of these funds." 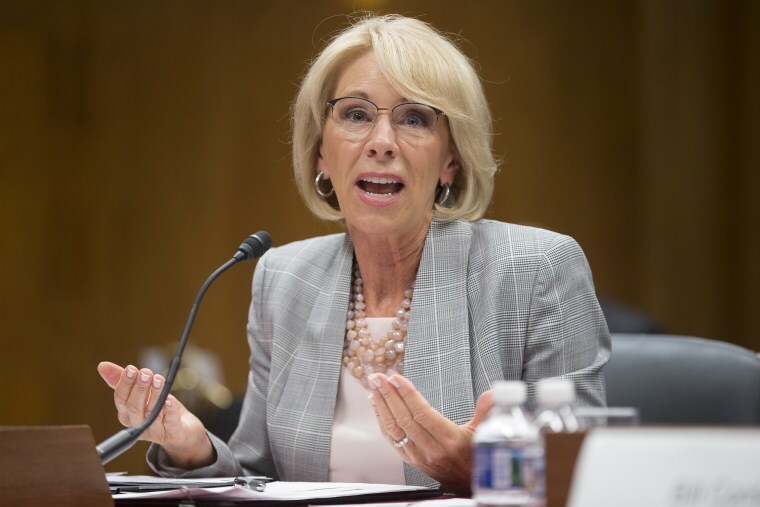 Randi Weingarten, president of the American Federation of Teachers, condemned DeVos for refusing to outlaw states using Title IV money to buy guns." "Betsy DeVos can't bury her head in the sand on this issue — she needs to listen, and act, on behalf of the children she's sworn to protect," Weingarten told NBC News in a statement. AFT and Giffords Law Center are part of a coalition of advocacy groups that have threatened legal action if the Education Department moves forward with its proposal to allow schools to buy firearms with the federal grant money. Members of the coalition, however, said they were still determining the best path forward in the wake of DeVos' letter. "It is deeply troubling that after immense criticism, Secretary DeVos is now attempting to punt responsibility for the administration's absurdly dangerous and potentially illegal plan to arm public school teachers," said Robin Thurston, senior counsel for Democracy Forward, another advocacy group that's part of the coalition. "We are watching Secretary DeVos very closely and we are prepared to turn our vigilance into legal action when necessary."